Monty Hall was the host of the American gameshow Let's Make a Deal in the 60's and 70's. At the centre of the show was a game in which contestants could either win a decent prize like a car, or something rubbish like a goat. This three door or Monty Hall problem, as it is now known, is a simple mathematical truth that is often widely misunderstood. Today the most likely place you're going to encounter something similar to the Monty Hall problem is on the TV show Deal or No Deal............but are the two problems the same? Imagine you are on a gameshow with a grand prize of a car. All you know is that the car is behind one of three doors, and behind the other two doors there's a dud prize of a goat (no offence meant to goat lovers, herders etc). You have to select one of the doors, entirely at random as you have no other information. After you've done this the host of the show, who knows what's behind all of the doors, will open one of the other two doors and reveal a goat. Next comes the crux of the Monty Hall problem, the host offers you a switch. You can either keep the door you've already selected, or switch to the other available door. Normal intuition tells you that there is no difference and therefore no benefit in switching at this stage. You originally had a 1/3 chance of selecting the door with the car behind it, now there are two doors so you must have a 1/2 chance of having the car and the other door likewise has a 1/2 chance of having the car. It's either behind the door you've selected, or it's behind the other door, 50/50? Actually no, you should always switch in this situation, doing so will double your chances of actually getting the car! I find it's easier to understand if you look at the problem visually so let's assume the car is behind door A and there are goats behind doors B and C.
You should be able to see that switching actually wins you the car 2/3 times or 66.7%. Not switching, by which you would only win if you'd originally picked the right door, only wins you the car 1/3 times or 33.3% of the time. Switching doubles your chance of winning big. You can test this yourself using a very neat Monty Hall simulator and run it through 1,000s of times. I ran it through 5,000 on switch, and 5,000 on not switch and these were the results. You'd potentially need to run it through millions of times to get to a true %, but it's pretty clear after on a few thousand as well. Switching gets you more cars than goats. That there is a difference in the results is down to variance and the (relatively) small sample size. So what about Deal or No Deal? In that there are more 'doors' to open, but the initial principal is the same. You select one and then gradually the others are eliminated from the game. Does this mean if you're left with £250,000 and 1p as your options in two closed boxes at the end of the game you should always switch? Errrr............No! Deal or No Deal is not the same as the Monty Hall problem because of one small but very key variable. 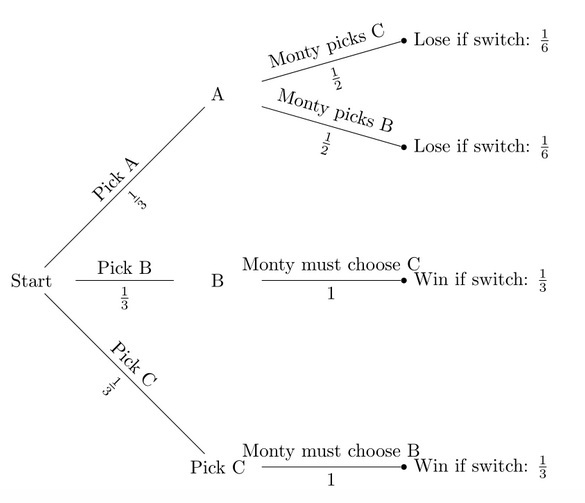 In the Monty Hall problem the host knows the contents of the boxes and will always pick a goat, in Deal or No Deal the selections are made entirely by chance by the contestent. There is no benefit to switching boxes in Deal or No Deal.............unless you feel lucky of course! If you want to learn more about how to beat online casino bonuses then we've got some excellent guides on the subject and if you're interested in probability then read up on the lottery, and martingale betting, both of which are mugs games. In closing, I'll leave you in the capable hands of Kevin Spacey in the film 21.